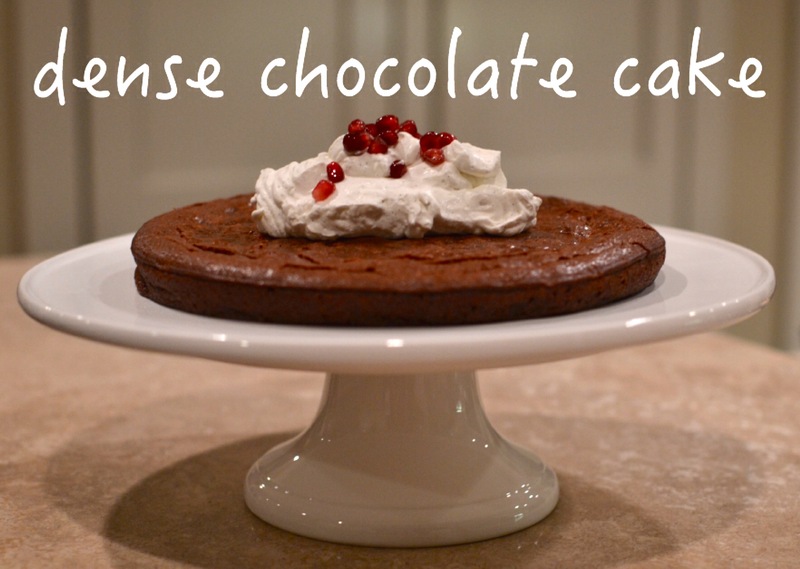 dense chocolate cake | Is there any wine left? I’d had a really, really great flourless chocolate cake at a restaurant earlier this year and was obsessed with recreating it at home. I tried three different recipes (utter and total failures) before landing on one from Food52. The trick was that it wasn’t actually flourless. One little tablespoon of flour gave it just the right texture — not too chewy and no need for a complicated water bath. It is quick, super simple, and I always have all of the ingredients in my pantry so it pretty much became my dinner party staple for 2014. There is a high likelihood that if you ate my house this spring or summer, this was the dessert we had. Easy + delicious = repeat appearances in my kitchen. Pre-heat the oven to 375 degrees F. Cut a sheet of parchment to fit in the bottom of a 9″ cake pan. Grease the pan with butter or cooking spray. Melt the chocolate and butter together in a double boiler. Use a whisk to combine until they are fully melted. Whisk in the sugar and then remove the pan from the heat. Let cool for 3-4 minutes. Add the eggs one at a time, being sure to fully whisk each one in before adding the next. Then whisk in the flour. Pour the batter into the cake pan and bake for 25 minutes. When you remove the pan from the oven, set it on a cookie cooling rack for 10-15 minutes. To remove the cake from the pan, invert it onto a plate and then revert it onto your serving dish. Cool completely before serving. Serve in wedges with whipped cream and fruit.